I remember when Sonoco used blue dye in their "240" and "260" premium fuels as went the saying "Blue Sonoco". The low Octane fuel (190) was green as I recall and became bluer as the blend went closer to 260. It later switched to gold for regular and red for premium in the 1980s along with all other fuel companies. The purpose of the die was to make it easy to identify what grade of gasoline it was. Now there are no dies added as they would clog fuel injectors in today's cars. Dad in the 1950's always preferred to pull into an Amoco gas station because Amoco gasoline was "unleaded." Wish I'd asked him "how" "what" and "why" but I just accepted it. 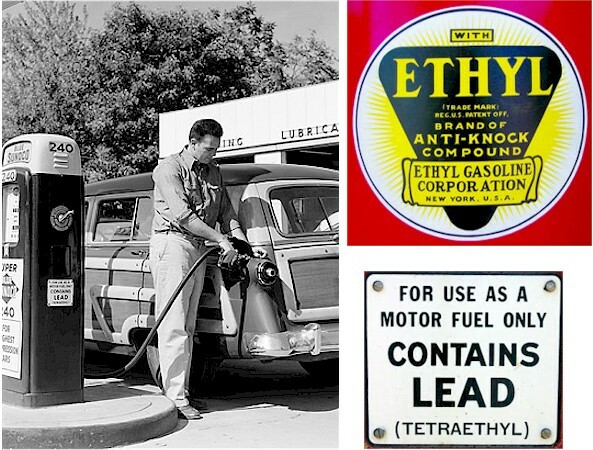 Remember the pumps with signs above them saying "leaded" and "unleaded." Always a couple of pennies different. Grandma called premium "ethyl" until she died. How about Texaco Sky Chief, that weird red stuff ? I used leaded as long as I could and even had my '75 Imperial tweaked to be able to use it (it was one of the first to use un-leaded).